Add Spice To That Room! You step through your front door, and you’re tired of the same old, uninspiring look. You know how you want the room to feel, but you don’t have a clue as to how to get there. You think of the motley acoutrements in your furniture collection and realize you’re stuck with them, at least for now. So how to get that refreshing new look for the living room without surrendering your paycheck? Before you go signing your life away, check your budget, and go for some decor accents, small items that can bring new life, add a touch of sophistication or a splash of color to a dull, tired room. Sometimes all that’s needed after you rearrange the furniture, is a single piece ‘with attitude’, a piece that can ‘converse’ with the other items of furniture, but one that will transform a corner and bring new interest to the room. In case you hadn’t realized it, you don’t have to embrace any of the conventional decorating slots that have been around for ages; unless your color combinations are inherrently ghastly, you can indulge yourself in your own personal taste to achieve a delightful effect. If you can’t afford the services of an interior designer to freshen the look in your living room, for instance, think about it yourself: What will the theme be? Do you like the look and feel of ‘country’ with just a touch of sophistication? Or would you prefer traditional themes, a formal or casual look? Do you prefer a feeling of warmth or a cool minimalist look? Are you comfortable with soft floral prints, or geometric patterns? After all, it’s your space, it should reflect your style, the way you connect color, shapes and textures. You’re the one who will have to live with it. Like the changes in the world of fashion in clothing and its accessories, home decor fashions also change. Look around a bit and find what look would make you comfortable. Though naturals are still all the rage, and jewel tones never seem to die, look at how shades of orange, chocolate, teal, apple green and even pink (no longer restricted to the nursery) are combined. It’s up to you and the look and feel you want to come home to. First things first: Can you still live with that egg-shell-white wall? Or with the peach of yesteryear? You certainly don’t have to. Indulge yourself. Two gallons of paint will hardly cost much, and you can check the magazines or television programs, on how best to paint the room yourself. Many of us are afraid of color, especially bold ones, since we think we might regret it later. It took me all of seven days to decide if I could live with one panel of living room wall in rich cranberry. Would it ‘speak’ to the other wall panels in sage? Fortunately, they hit it off fine. What you need to do is find a color that complements the furniture you hope to use, and a hue that relaxes you. By the way, the cranberry added a touch of excitement to my room. Well, you’ve looked at the budget, and there is no way you can rush out to replace the tired old sofa. Think slip covers, an inexpensive alternative. They’re more streamlined and snug-fitting these days, and don’t have to look at all Victorian. 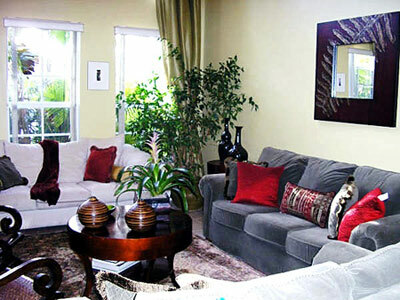 Think of the use of the sofa, the children or the pets, and choose color and fabric accordingly. Do your research well. One major area that will pick up any room is the window treatment; just remember that unless the look is baroque, the heavy, ornate and poufy, ponderous look is definitely passé. Go for simplicity, think simple valances, and maybe side panels in light fabrics that speak summer and light. Living away from the Caribbean has made me yearn for the island feel, and my ideal and most relaxing decor comprised a more global look, where Eastern and Western motifs co-exist in delightful harmony. To revive my living room after the paint job, I installed simple faux silk panels for the 18-foot windows, slip-covered an Italian suede sofa I just couldn’t afford to replace — and did it in a different color from the other sofa too. A single throw and some cushions in vibrant tones from Jaipur, India added a rich feel to the room, and to add to the international feel, I threw in two plantation relax chairs in teak from exotic Bali, and a prize mirror from Madagascar, framed in cranberry-stained balsamwood, to keep company with the wall whose color took me seven days to decide. The result: a look that is not casual, and neither formal and stuffy, just comfortable with a few hints of the sophisticate. After all, I wanted my guests to feel comfortable and relaxed too.